On 5th/6th September Pirates invaded Avon Tyrell for our annual camping weekend. On Saturday around 50 of us set up base camp with the distinctive yellow and black gazebo as our focal point. Pirates and parents hit the cycle trails in numbers, stopping at technical challenges to practice, practice, practice. Generally, the kids were showing the parents how it's done! The pump track and gravity track were very popular, with Matt winning the prize for getting the most air off the table tops (see photo) and Ben winning the prize for being closest to taking out the camera woman. Also, of particular note was Adam and his acrobatics! We enjoyed a fantastic communal meal with donations from everyone, followed by an evening around the campfire. On Sunday we woke up to beautiful sunshine. Ian prepared his famous 'one eyed Egyptians' for breakfast, followed by more cycling, swimming and a very competitive game of bicycle polo! When you see parents with polo sticks you can see where the kids get their competitive steak! A sunny Bournemouth Arrows track meet for all age groups. Solent Pirates had a large contingent of riders, first timers through to our more experienced 'omnium' riders. The day started with two team events. We entered two teams of 3. Big thanks to Sam, who rode in two of the teams, completing 2 x team sprint and 1 x team pursuit. Great work Sam! The most exciting team pursuit was undoubtedly SP1 (Ella, Kara & Sam) versus our friends at Poole Wheelers. It was a nail biting race, where the lead swapped over several times and the finish was so close, we weren't entirely sure who won! The racing then moved on to individual events - handicapped scratch, elimination, points race and standard scratch race. All Pirates raced skilfully and safely. We finished the day with lots of podium places (see photos), both Lewis and Jamie were placed in all of their races (4 trips to the podium in total)! Well done boys. Holly and Johnny both raced for the first time on the track and came away with big smiles (I think they'll probably be back). Well done you too, we were really impressed. The riders had fun on and off track with cycling buddies from other clubs. A great end to a good track season. Jamie W represented the club at the Youth Omnium Final at the weekend, here the story of how it went for him. Jamie was very happy to qualify for nationals, the day arrived and he was up at 5am, very excited! There was 29 U12 boys, the standard was incredible. First race was the 1 lap Time Trial, he had no one else in his heat so he got a fantastic commentary, finishing 27th. Next the Elimination race, the U12 boys split into two groups using the TT results (1st place first race, 2nd place second race, 3rd place first race and so on). Jamie was in the first race and was expecting to come out first or get dropped, this was the race he was least looking forward too. Anyway he was 6th to get called out and still in the bunch at this point, it was a very close and exciting race to watch. He finished the Scratch race 27th, then last in the Keirin. He was disappointed by this, but picked himself up and gave everything he had in the Points race, finishing 25th. 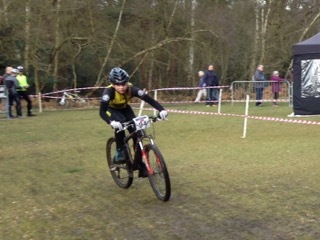 Jamie finished 27th overall, placing ahead of two other southern riders, both of whom qualified ahead of him and had beaten him in every southern round. He was so happy and proud of himself, big efforts and big smiles, a fantastic day. We were at the Winchester Criterium on Sunday. For all those who came along, it was a great day of fast and really challenging racing. Good entries, sunshine and large crowds again made this one major highlight of the summer road season. We had over 30 riders ranging from first timers in the Under 8's right up to our experienced Under 16's. It was rewarding to see them all do this with such skill and composure. We had podiums, near podiums, crashes, equipment failure and every other possible outcome and emotion. In the end most of the riders left having had a memorable and very rewarding day racing and supporting fellow riders. Here's what some of our riders thought of the day. Sam F. (U14): It was a great day and the best Winchester Criterium race yet. It looked like everyone enjoyed themselves. I was a bit nervous at the beginning but I had a great start, I had an awful start last week at the Winchester Park & Ride Criterium race. It it was good to see loads of supporters and loads of Solent Pirates. Oliver M. (U10): The event was a lot bigger than I thought it would be and was very tough. It was great to ride as a Pirate for the first time.The event was really well organised. I need to practice cornering before the next race. I can't wait until the next race. Racing on Sunday has made me feel a lot more confident. Isaac H. (U8): I did some bad cornering and crashed twice, but it didn't hurt. I need to practice cornering more. The whole day was epic! Well done to everyone for such a fabulous day. Our youngest training group, the Gruppetto, practising and having fun during our session on Thorney Island. Sundays XC MTB race (Southern Regional Championships) was held at Wasing, near Newbury, once again a nice atmosphere and superbly organised event. Three of our riders competed in the juvenile category and completed the tough very technical course including drop-offs, steps, technical uphill and fast single track sections. In a very closely contested race Amy P came home with the trophy for 2nd place. Callum & Jamie took part in the Southdown Sting CX sportive on Sunday, it certainly lived up to the name, at 7 miles I recorded a 22% incline! The terrain included deep ruts ( up to the spindle) on wet clay, steep slippery drops, gravel & sand. The boys were lucky to only puncture once, one poor rider had 4! 2620 ft, showed great skill & control on such challenging terrain. And the bikes got home in one piece! Here's Amy's account of her race, and a training day she was invited to. The Southern XC MTB series race at Black Park was my first MTB race and i was very nervous before the start. I knew i had the skills from cyclocross racing and all the MTB bike skills training we had been doing, so i was confident i would be able to cope. It was a fast course with some obstacles, single track and drop-offs, extremely hard work but very enjoyable and i was impressed with my position. The event was very well organised and there were races for all ages, even some little kids on a mini-course on balance bikes! I’m really looking forward to the next race. This weekend I was invited to a British Cycling MTB Regional School of Racing (RSR) training day at Hadleigh Park, Essex (where the London Olympics races were held). We were focussing on skills such as bunny hopping, front & rear wheel lifts with flat pedals (no cleats). It was a fab day, especially as the sun was shining and I learnt tons. I’m really keen to get on my bike and practice all these skills now! Older sessions, events and races from 2012 & 2013 can be viewed here, and 2014 here.